Well all of us lucky Sprint users are getting an early Christmas gift. 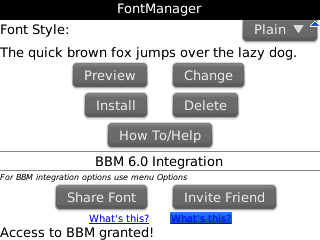 FontManager by Quite Simple allows you to add any font to your BlackBerry device. The app, usually $2.99, is currently available for all Sprint users for FREE until December 22nd. Manage your fonts, add more customization and share your favorites with your BBM friends. Head on over to BlackBerry App World and download your FREE copy today! Non-Sprint users can still download the app for the purchase price of $2.99.